King County Executive Dow Constantine signed a new two-year Total Compensation Agreement this week with leaders of the King County Coalition of Unions representing nearly half of the County’s 14,000 employees, and penned an op-ed article in the Washington State Labor Council’s TheStand.org publication about the agreement. In the article the Executive talks about significance of the agreement, its key elements, and the importance of King County’s strong relationship with labor. “I appreciate the value that unions bring to their members and to the broader community,” Executive Constantine wrote. “Our employees are the backbone of our organization. They choose public service because they want to make a difference in their community. Our role is to work together as partners, even when it is across the negotiating table, so we can provide compensation and a workplace culture that supports them.” Read the full op ed. 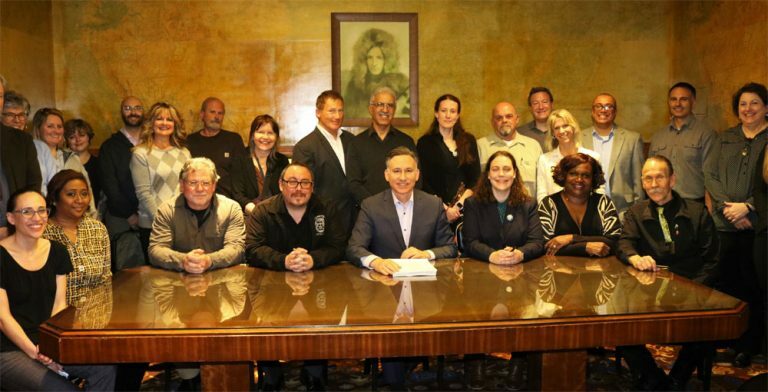 Pictured: Executive Dow Constantine, administration officials, and labor leaders in the King County Coalition of Unions at the April 9 signing ceremony.